Knysna has been busy with literacy projects this past year, and most of our Matching Grants also have a literacy component. SOUNS LITERACY PROGRAMME Knysna RC, in conjunction with the Knysna Education Trust, has continued to expand the SOUNS Literacy Programme at 48 pre- schools in the greater Knysna area townships, and rural communities. This programme was developed by Brenda Erikson, a Rotarian from the Peachtree Club in Georgia USA, who be- lieves that literacy should be introduced from a very young age (less than a year old) and be mastered by means of the kinaesthetic sense (the dominant sense at that age) rather than the usual visual and auditory senses. Of course, all senses come into it later. Brenda managed to have all 48 sets of SOUNS letters sponsored by Rotary Clubs in her District, so it is truly a Rotary project. Brenda and her husband visit South Africa twice every year to monitor the progress of the programme, which is being used very successfully in Afrikaans and Xhosa in our area. 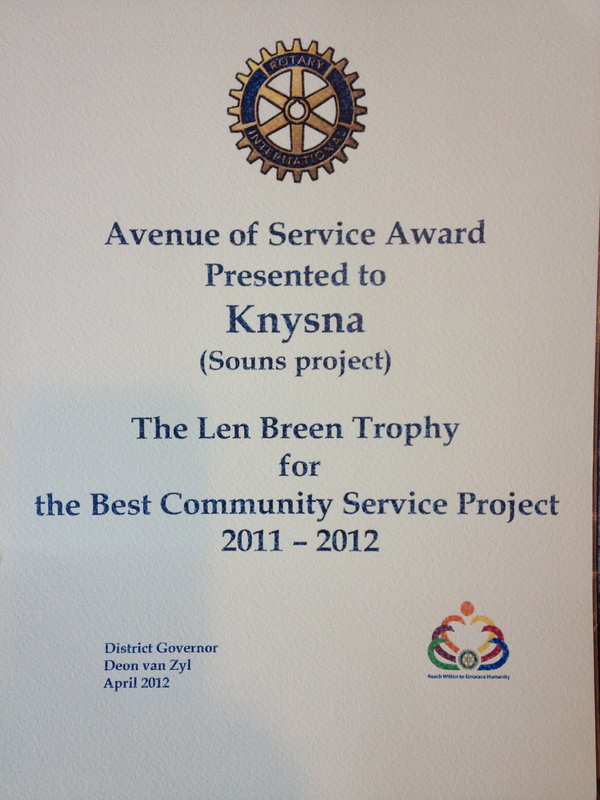 Through KET, SOUNS programmes are being used in the Mossel Bay area, sponsored by Mossel Bay RC, and also Pretoria, through a local RC there. This entry was posted in Rotary Projects, SounsAfrica and tagged District 9350, early literacy, global literacy, RD6900, reading, Rotary, Souns, South Africa. Bookmark the permalink.